More than 58 million Americans use Uber, Lyft or another rideshare transportation option to get from A to B. These companies offer convenient travel through just a few steps on their apps, but at what cost to the passengers and drivers? Essentially, anyone who can pass a background check can qualify to be an Uber or Lyft driver, classified as independent contractors. Florida has more than 100,000 Uber drivers alone, with countless more driving for other rideshare platforms. These high traffic numbers increase your likelihood of being in an auto accident. If you’ve been injured in an auto accident involving a rideshare company, please contact us in Miami today at (855) 375-3727 for a FREE case evaluation. The Hickey Law Firm serves the Miami, Florida area and nationwide. Partner Injury Protection is offered to all Uber drivers as of August 1, 2018. Drivers have insurance protection from the second they accept the trip or delivery and continues through the end of the ride. This driver safety plan provides coverage to all drivers and delivery affiliates. The plan includes the cost of emergency medical treatment for injuries incurred while driving for Uber. You could also be eligible for lost wages if you’re no longer able to drive. Passengers of Uber drivers are also covered under the provided insurance as long as the driver was at fault. If another driver, company, or individual is responsible for the accident, Uber passengers file claims against them. Pedestrian accidents are also a concern, which can include crashes where you’re the rider, and your driver hits a pedestrian or a situation where you’re the injured pedestrian. Contingent Liability: Available when personal car insurance does not apply, such as when the driver is in “drive mode” but hasn’t accepted a ride yet. No deductible. Primary Automobile Liability: This applies from the moment the ride request is accepted to when it’s ended. Some drivers have personal or commercial insurance to ensure rideshare coverage when they’re working. The Lyft insurance would then cover the expenses not included in the driver’s individual plan. Contingent Collision: Available for the cash value of the vehicle or repair costs, whichever is lower. There is a $2,500 deductible, regardless of fault. Contingent Comprehensive: Drivers are required to have their own comprehensive coverage. The Lyft contingent comprehensive coverage is for vehicle damage not caused by an auto accident, such as fire, theft, and environmental damage. This plan also covers repair costs of cash value with a $2,500 deductible, regardless of fault. Uninsured/Underinsured Motorist Coverage: Auto accidents with a driver who does not have insurance or adequate insurance coverage are covered when the underinsured or uninsured driver is at fault, and the rideshare accident led to personal injury for passengers and/or the driver. There is no deductible for this policy, but it varies by state. Liability for injuries and property damage up to $1 million. $50,000 maximum per person injured in an accident caused by the rideshare driver. $100,000 total injury liability per accident, which is the cap regardless of how many were hurt or how badly. Coverage for uninsured and underinsured accidents along with hit-and-run incidents up to and more than $1 million. A $1,000 deductible for crashes that were not the Uber driver’s fault, which can cover the full cash value of your vehicle. $25,000 for property damage, which is the maximum compensation for vehicles or properties that were damaged due to the auto accident. Both Uber and Lyft have 24/7 support available for emergencies and guarantee every trip is insured. The apps also have easy-to-use sections for accident claims, emergency assistance, and details of the trip to help with a police report. It’s important you contact an auto accident attorney with experience in rideshare incidents as soon as possible. We can make sure you’re compensated for all of the expenses you’ve accrued because of your injuries and impact on your life. The goal of insurance companies is to pay as little as possible, so while these coverage plans seem adequate, you may still have trouble recovering the full cost of your medical expenses and pain and suffering. The coverage is dependent on whether the driver is logged onto the app and whether they are transporting passengers at the time of the accident. If the driver is not using the Uber or Lyft app to provide rides, their personal car insurance coverage will be liable for your injuries and the overall costs of the accident, not the rideshare company’s insurance. Drivers are required to carry insurance that meets state standards. 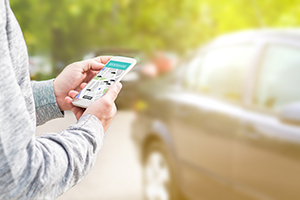 If the driver is logged into the app but has not accepted a ride request, the rideshare company’s liability coverage applies if the driver was found to be at fault. If you’ve been injured in an auto accident involving a Rideshare, please contact Hickey Law Firm in Miami, Florida today at (855) 375-3727 for a FREE case evaluation. Our experienced lawyers serve clients in Miami and surrounding areas of Florida and nationwide.